VISTA, Calif.--(BUSINESS WIRE)--Nov. 23, 2018-- KB Home (NYSE: KBH) today announced the grand opening of Sierra, a distinctive collection of luxurious new townhomes in Vista. Situated near Interstates 5 and 15 and just north of Highway 78, Sierra is also close to the Oceanside Metrolink® station, offering convenient commuting to California State University San Marcos and Palomar College and throughout San Diego County. The charming beach communities of Oceanside and Carlsbad, as well as LEGOLAND® California Resort, are all within a short drive of the community. At Sierra, residents can enjoy a planned community pool and barbecue area, and ample guest parking. At nearby Brengle Terrace Park, residents will find a recreation center, botanical gardens, playgrounds, picnic areas and a moonlight amphitheater that hosts a variety of seasonal events. KB Home will be constructing 60 townhomes in total and offering three distinct floor plans. Ranging in size from 1,600 to 1,900 square feet, with three bedrooms and two-and-a-half bathrooms, the KB homes at Sierra also feature such desirable design characteristics as dedicated laundry rooms, spacious great rooms and elegant master suites. Pricing begins in the low-$500,000s, with no Mello-Roos. 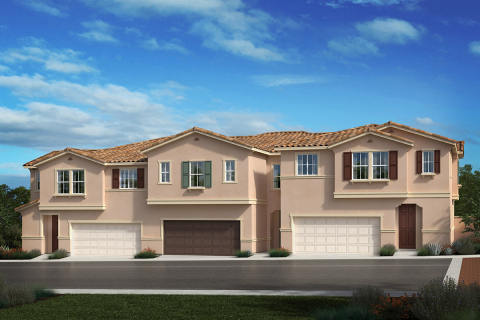 The KB homes at Sierra will be built to current ENERGY STAR® guidelines and include WaterSense® labeled faucets and fixtures, meaning they are designed to be more energy- and water-efficient than most typical new and resale homes available in the area. These energy- and water-saving features are estimated to save homebuyers between $468 and $828 a year in utility costs, depending on floor plan. As part of KB Home’s distinct homebuilding process, buyers may personalize many aspects of their new home to suit their budget, design style and preferences. After choosing their lot and floor plan, KB homebuyers may work with expert design consultants who guide them through every aspect of the process at the KB Home Design Studio, a retail-like showroom where they can select from a plethora of design and décor choices, including countertops, cabinets, lighting, appliances and window coverings. Sierra is located at 1338 Mesquite Dr. in Vista, Calif. From Hwy. 78, exit Civic Center Dr. heading north. Turn right on South Santa Fe Ave., then right on Ironwood Lane. The community is on the right. The sales office is open Saturdays and Sundays from 10 a.m. to 6 p.m. and Mondays through Fridays from 9 a.m. to 5 p.m. For more information about Sierra or KB Home’s other new-home neighborhoods, visit www.kbhome.com or call 888-KB-HOMES. KB Home (NYSE: KBH) is one of the largest homebuilders in the United States, with more than 600,000 homes delivered since our founding in 1957. We operate in 36 markets in eight states, primarily serving first-time and first move-up homebuyers, as well as active adults. We are differentiated in offering customers the ability to personalize what they value most in their home, from choosing their lot, floor plan, and exterior, to selecting design and décor choices in our KB Home Studios. In addition, our industry leadership in sustainability helps to lower the cost of homeownership for our buyers compared to a typical resale home. We take a broad approach to sustainability, encompassing energy efficiency, water conservation, healthier indoor environments, smart home capabilities and waste reduction. KB Home is the first national builder to have earned awards under all of the U.S. EPA’s homebuilder programs — ENERGY STAR®, WaterSense® and Indoor airPLUS®. We invite you to learn more about KB Home by visiting www.kbhome.com, calling 888-KB-HOMES, or connecting with us on Facebook.com/KBHome or Twitter.com/KBHome.